- World-renowned marathon coach and LRC poster Renato Canova, talking about his new coaching relationship with Ryan Hall and how it began. Brilliant idea: Why not have two NYC marathons next year back-to-back? Psychiatrist says that distance runners and cyclists are usually people who are "mad at the world"
Abel Kirui Says He'll Run London In April And Then Focus On Defending His World Championship Title “The World marathon title is important and I must defend it. I will shelve any other plans to focus on this one ... Rio in 2016 is still a possibility and I can not shut out myself saying I will not be able to make it then. But this is Kenya and four years in marathon running is a long time." Valerie Adams Among Top Names Searched By New Zealanders On Google She was 6th on the overall people list (Usain Bolt was #4) and first on the list of New Zealanders (Nick Willis was 6th). UK Triple Paralympic Judo Gold Medallist Convicted For Tax Fraud He is visually impaired and claimed $17,581 in his taxes for taking taxis to work when really his wife was driving him. BOA Urging UK Businesses To Hire 2012 Medalists Who Need Jobs The BOA is hosting a job fair with over 200 UK Olympians will have a chance to get hired. Jessica Ennis Says Long Delay To Get Back Into The Olympic Stadium Is A "Shame"
British Poll: Vote For Sports Moment Of The Year Since it is a British Poll, of course "Super Saturday" is winning. Ultra Runner Jez Bragg Running From The Top To Bottom Of New Zealand (1,863 Miles) In 50 Days Just For Fun "In training for the big trail races, I noticed that the parts where I had the most fun was when I was on long runs in remote places; I really enjoyed losing myself in the runs where the journey was more the point than the destination. This seemed like a true journey, the pinnacle of what I can do." Who Should Be Britain's BBC Sports Personality Of The Year? Related: Usain Bolt And Serena Williams Named Sportsman And Sportswoman Of The Year By French Daily L'Equipe Bolt 2.0 is a bit of a boring pick for us compared to the original, but Serena did win Wimbledon, double Olympics and the US Open. Asafal Powell Escorted New WBA Featherweight Champion Nicholas "Axeman" Walters Into The Ring For His Historic Title Fight "We are trying to take over the whole sporting world." The fight was the 1st title fight on Jamaican soil. Two-Time Olympic Relay Gold Medalist (And 9.88 Man) Michael Frater Leaves MVP Track Club For Glen Mills And Usain Bolt His old coach Stephen Francis may have asked him to leave. Olympic Gold Medalist John Walker Organizing The Return Of Auckland's Queen Street Mile This April, Which Is Owner Of The Fastest Mile Ever Recorded In 1983, Kenyan Mike Boit ran the downhill course in 3:28.3. Coach Of Ireland's Euro XC Champ Fionnuala Britton Says He Expects Her To Eventually Be A Star Marathoner By 2016 He wants her to spend 2 more years on the track first, though. Jessica Ennis Talks About Dealing With Pressure Of Being The Hometown Favorite In London & How She Never Expected To Gain That Kind Of Fame "I'd literally have to fall over in the 800metres not to win it then. ... I'd trained so hard, done so many horrible 800m sessions ... If I'd just jogged round, what would have been the point of all that pain? And I really wanted to cross the line first. I really wanted to have that moment. I’ll never have it again." French TJer Teddy Tamgho Says He Will Skip The Indoor Season To Focus On 2013 Moscow World Champs Tamgho has not competed for 18 months because of a fracture to his right ankle. He also has a court case in March about the altercation with a female athlete that happened back in October 2011. Over 500 Athletes Will Compete In Kisumu City Marathon In Kenya This Weekend AK chairman Isaiah Kiplagat emphasized that they will have anti-doping tests. Iten, Kenya: Shoe4Africa Women’s 5km Race Set For Christmas Eve Sylvia Kibet, Lornah Kiplagat, Florence Kiplagat, Edna Kiplagat and Mary Keitany have all run here in the past. The race also gives out hundreds of free pairs of second-hand running shoes each year. New UKA Head Coach Peter Eriksson Is Happy To See Paula Radcliffe Try To Continue Her Career Talking about the new training hub in Loughborough, he said not all athletes have to live there, but can come and go. The Guardian Video: "Why Jessica Ennis Should Win Sports Personality Of The Year Award"
RR: Paula Radcliffe: "I'm kind of at that crossroads coming off a big surgery and I desperately don't want my career to be finished." The plan is to be back running by Christmas and then start racing next year with a 10k or half in the spring and a marathon in the fall. *UKA Chairman Ed Warner Says Retractable Seating Is Key To The Success Of The Olympic Stadium And Says They Should Have Been Installed From The Start He said retractable seating "allows us to use the stadium for all the athletics we need each summer, big rock concerts, and for a full football season" and be used 52 weeks a year. Hey, Athletics Kenya - Listen Up: Kenyan Journalist Writes Open Letter To AK President Explaining Why Holding Their 10k Trials In Eugene Was A Bad Idea Apparently AK is talking about outsourcing the Trials for the World Championship 5k/10k team as well. 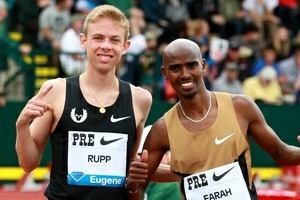 If they want to shoot themselves in the foot like last year, we're sure Mo Farah and Galen Rupp won't mind. NYRR Still Working Out Post-Cancellation Details, But Release Very Small Detail They say the marathon will still count for 9+1 program, which gives NYRR members a means of guaranteed entry into the marathon. Ryan Hall To Be Coached By Renato Canova America's 2:04:58 man, who just turned 30 in Oct., blogged today that he'll be coached by famed coach Renato Canova - the famed LRC poster who in the past has coached/advised many Kenyan stars. We wonder if the relationship will be a traditional coaching one or more of an advisor role. *Canova: Hall is "such a great talent." 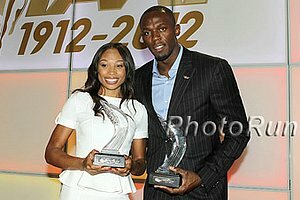 Usain Bolt, Allyson Felix: 2012 IAAF Athletes Of The Year Bolt won out over Aries Merritt and David Rudisha and of course Mo Farah (who was not a finalist, which means he didn't finish in the top 3). Jessica Ennis and Valerie Adams were the other women's finalists. LRC cast its ballot for Rudisha and Felix. The IAAF should release the vote tallies. Recommended Read: Update On Twin NZ Runners Jake And Zane Robertson, Who Moved To Kenya On Their Own At 17 Years Old To Pursue Their Running Dreams Zane: "Without Jake I wouldn't have survived. I would have given up. Having each other, when the other one was sick or down, you raise him up. In the concrete cell that kept us going. ... I'm so thankful we went through those hardships for one or two years, because going through them, the way Kenyans do, if you survive you can go through anything." Haile G Tweets About His DNF At Fukuoka He says he had a leg cramp and couldn't lift it. But he'll be looking for another marathon to run because he feels he's in "good shape." 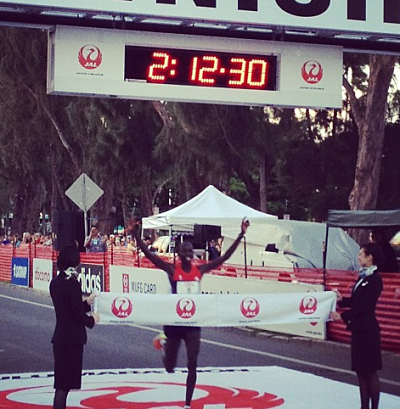 IAAF Recap Gitau was a huge surprise winner has his PR before this race was 2:21:54. Geb dropped out at 32k while Mathathi made it to 38k. Video Interview With Danny Tapia *Interview With Alisha Williams She thanks the "awesome guys" who let her and Peterson sit behind them for large portions of the race. MB: **OFFICIAL CIM THREAD** *CIM - 35 mph headwind? Dutch 15k: Geoffrey Mutai Sets CR At Heereenberg 15k In The Netherlands With 42:25 (4:33/ Mile Pace) Mutai beat a deep field including Philip Langat (a close 2nd in 42:26), 2:04:50 man Getu Feleke (3rd) and 2:04:16 marathoner David Kimetto (6th). Ethiopian Atsede Baysa won the women's race in 49:15. *Good Race Video Of Geoffrey Mutai Winning Netherlands 15k (Commentary In Dutch) Skip to 2:29 into video for race coverage. Athletics Illustrated: Ryan Hall And Renato Canova Talk About Their New Coaching Partnership Canova: "I didn’t speak about his career, that I knew very well, neither about his previous training. I was not interested in these particulars. I wanted to know something more about his motivation, his life, his relation with the faith, his objectives, his current physical conditions (not really good)." Alberto Salazar Says Galen Rupp Won't Run A Marathon Until After 2016 Olympics Salazar: “He’s just really coming into his peak years on the track and he’s still improving there ... You move up when you feel you’ve sort of plateaued at the lower distance and only when you feel you’re not a medalist at the shorter distance." Spikes Magazine Interview Morgan Uceny From Her New Training Base In Loughborough, England She says that coach Terrence Mahon said she did nothing wrong in London, she thinks men are better at running tactically then women, and ends by saying, “I just need to get on the podium. I’ve had my goals for several years and I just need to make it happen.”. RW Brief Chat With USATF Club XC Champ And Hansons Runner Jake Riley He says the big thing that drew him to the Hansons program was knowing he'd have a good training group for all his workouts. WSJ Continues It's Campaign To Discourage People From Exercising: Study Says Playing A Round Of Golf Is Just As Beneficial As A 100-Mile Bike Ride For Aiding Longevity We stopped reading after in the second paragraph we saw the study is based on data taken from Olympian mortality records between 1896 and 1936. On The Other Hand... Study Finds Olympic Medalists Live On Average 2.8 Years Longer Than Average Population This study looked at Olympic athletes between 1896 and 2010. NYRR Announce Via Twitter That Registration For The 2013 Marathon Which Was Set To Open Wednesday Has Been Delayed They're still trying to sort out all the issues with the 2012 cancellation. 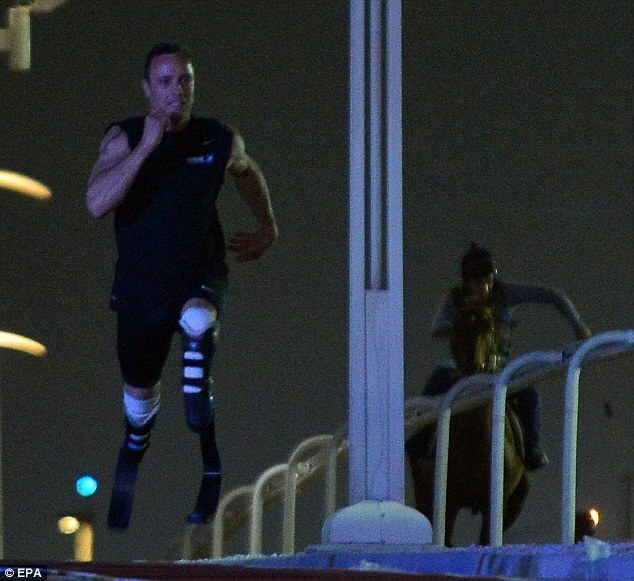 Oscar P. Beats Famed Horse Maserati In Handicapped Race Those of you, like us, who think Oscar P benefits from his blades won't be happy about this race. Oscar got a 15m head start and ran on a track, whereas the horse ran on sand. 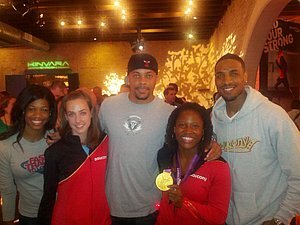 "Go Out There And Break A Leg": US 4 X 400 Runner Manteo Mitchell Did And Usain Bolt Got His Picture Taken With Him As A Result President Obama also noticed and mentioned him in a speech. Leo Manzano's 1st Racing Victory Came When He Beat His Grandfather, Who Was On Crutches, At Age 4 Manzano gave a speech in far West TX near the NM border. 2013 Dubai Marathon Is Set For Record Registration, Iincluding One From Moses Mosop The 2:03:06 man hasn't been seen since "disappointing" with a 2:05:03 in Rotterdam in April. Ruthless: Defending Champs And Course Record Holders At Prestigious Hakone Ekiden Cut Team Captain In Pursuit Of Hakone Title Defense The 29:14 guy, who apparently is in good shape and ran the fastest anchor leg of anyone last year, isn't one of the 16 guys named (10 runners and six alternates) to the provisional list. More College News: After Bolting Stanford For Kentucky, Edrick Floreal Is Trying To Pump Up Sport In Bluegrass State But Says Only 60% Of Athletes Have Bought In "I would say about 50 or 60 percent are committed and have bought into the process. I think there's about another 40 percent that are maybe a little nervous about what's asked of them." Bad News: Desiree Davila "Miserable" And Barely Running As She's Still Not Pain-Free From Her Femoral Stress Fracture That Ruined Her Olympic Marathon She's up to running 30-35 minutes a day. You Know You've Got Power When States Go Out Of The Way To Tax You Less: Oregon Legislature Holding Special Session To Assure Nike Their Taxes Won't Go Up Basically Nike creates so many jobs in Oregon, they want to make sure any expansion Nike does stays in-state and are willing to lose the estimated $20 million in taxes they could get, in order to keep them there. Good Day For Stanford: Foot Locker Runner-Up Sean McGorty Commits To Stanford So to did NXN champ Sam Wharton and FL 6th placer Sophie Chase. Toni Reavis Argues That When It Comes To The Marathon, We're Too Hung Up On Time "The sport has become so hung up on time that we have all but eliminated personality driven competition from the minds of a constantly dwindling fan base." NY Times Writer Talks About How College Sports Have Become A Business And It's All About Money "Football games are routinely described as 'product,' television networks are 'distribution channels,' and rooting for State U. is an example of 'brand loyalty.'" Philip Hersh Asks The Question If The IOC Can Take Away Lance Armstrong's Medal After The 8-Year Statute Of Limitations, Why Not Do The Same For The Doped East Germans Hersh says "There actually is more documented evidence of East German doping than there is of Armstrong's" and considering USADA's billion-page report on Armstrong, that's saying something. Speaking Of Doped East German Medals/Records: Will We See A Female World Record In 2013? With the exception of the recently set 4 x 100 record (by the US in London), all women's track WRs from 100 to the 4 x 4 are over 20 years old (before sophisticated drug testing). However, this writer thinks we could see records go down in the 4 x 400m and the 400/100 hurdles. Better Late Than Never: Kenyan Government Launching Investigation Into The Dopping Allegations Made By German Journalists AK Chairman Isaiah Kiplagat says the delay in the investigation was not deliberate but because AK had handed over the matter to the government. Recommended Read: Good RT Q&A With NCAA Champ Betsy Saina, Who Talks About Her Training And Winning NCAAs You might think everyone in Kenya is into running, but when she calls her parents to tell them she won NCAAs they say, "Good job," but they have no idea what she's talking about. Betsy Saina Talks About Her Journey From Kenya To NCAA Champ And Both Her & Coach Corey Ihmels Describe The Kenyan Recruiting Process As A "Crapshoot" "When you are in Kenya and you go to [train] and you find a white person doing recruitment, it's kind of exciting. I ended up running a good race, and he started off saying: 'Do you want to come to Alabama?'" 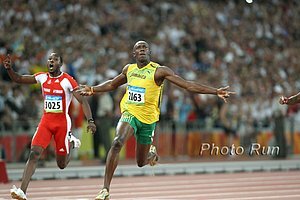 Jamaican Distance Runners (Yes, They Exist) Complain That The JAAA Focuses On On Sprinting To The Detriment Of Distance Runners Marathoner Rupert Green: "Everything in Jamaica is sprint, sprint, sprint. Results do not come overnight. It takes years of training and competing at the highest level. But it seems that the administrators in Jamaica have no patience for that philosophy ... Even if we make the qualifying time for an international race, they say 'Boy, well, yuh know, you qualified but we were hoping for more.'" RIP: Athletics Ireland Pays Tribute To The Passing Of Olympian John Kelly, A Man Who Did It All Kelly was a 1968 50k race walk Olympian, but also won the '65 Philadelphia Marathon (running 2:37 in several inches of snow), was 7th in the '64 US Olympic Marathon Trials and participated in the Australian OT in the hammer throw and heavyweight boxing. One LetsRun emailer described him as "one of the original badasses - a blue collar guy before there was a blue collar guy." Local Kentucky TV Station Streaming USATF Club Nationals Broadcast Monday-Friday This Week 9PM ET Includes race footage with commentary. Michael Heald Publishes Collection Of Essays (Many Running-Related) In His Book "Goodbye To The Nervous Apprehension" Heald is the author of "It Should Be Mathematical," the three-part article on Ian Dobson and Julia Lucas at the Trials, which was the LetsRun QOD in the summer. That piece, as well as one on Galen Rupp, is included in the book. Q&A With 2004 Olympic Marathon Trials 4th Placer Trent Briney, Who's Made The Move To Ultra Running He was recently second to Max King in the JFK 50-Mile Run. Philadelphia Inquirer: Sports Psychologist Asks The Question Why Athletes Take Performance-Enhancing Drugs "Money and fame are the obvious short-term answers ... in our culture being #1 has never been more important and affords an athlete a great deal of prestige, status, and power." USOC Announce Warrior Games To Take Place In Colorado Springs In May To Support The Recovery Of Wounded Soldiers Includes five US teams representing the Army, Marine Corps, Navy/Coast Guard, Air Force and Special Operations, as well as one international team from Britain. Honolulu Marathon: Wilson Kipsang Solidifies World #1 Ranking With Negative Split Win 2:04:54 man Markos Geneti was 37 seconds back in second. 2008 Olympic decathlon champ Bryan Clay ran 4:46:31. Women: Russia's Valentina Galimova Comes From Behind To Win In 2:31:23 American Stephanie Rothstein Bruce was third in 2:32:47. *Bryan Clay Ran The Honolulu Marathon With His Wife Only 8 Weeks After Having Surgery For Five Hernias Clay: "It was a beast. The decathlon is a completely different animal." USATF Club Nationals: Hansons-Brooks Distance Project's Jacob Riley And Boulder Running Company's Mattie Suver Win Club XC Titles Hansons-Brooks men and Team USA Minnesota women won the team titles. On the men's side, brothers Craig and Matthew Forys were second and fourth. 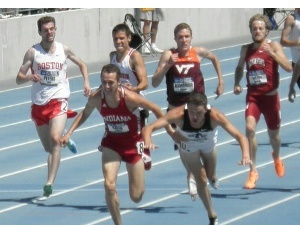 US mile record holder Alan Webb was 7th. Other Weekend Results: Jesse Squire At T&F Superfan Reviews Weekend College Marks North Carolina State's Ryan Hill led weekend performances, winning the 5,000 at Indiana's Hoosier Open in 13:43.52 over IU's Zachary Mayhew (13:51.79). *World Half Marathon bronze Medallist John Mwangangi And Pauline Njeru Win 15Km race honours during Safaricom Imenti South Road Race 15k Patrick Makau was present and said he was preparing for London 2013, but decided to offer himself for team selection to the Kenyan Moscow 2013 team instead. *Lawi Lalang Opens Indoor Season With A 3-Race Workout He won the 1,000m (2:30.16), 600m (1:22.18) and 3,000m (8:51.09). Recommended Read: Emil Zatopek - An Incredible Runner (4 Olympic Golds), But An Even Better Man You may know about his legendary workouts like 60 x 400 in army boots but may not know he was a very kind man. 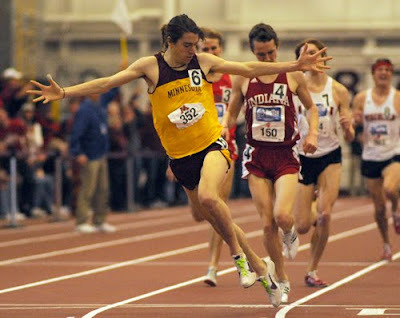 3:37.23 Man Ben Blankenship Is On Comeback Trail Now As Part Of OTC Has a 3:37/3:54 collegiate miler ever gotten less pub than this guy? He was the 3k runner-up to Heath in 2011. Despite Gold & WR, David Rudisha Still Dreaming Big On & Off Track He wants another Olympic title in 4 years and hopes the youth are used to promote peace in Kenya, instead of being used as props by politicians. "One would say I have it all ... a World title, Olympic title and the world record but I always have something to motivate me." LRC The Week That Was: November 26 - December 2, 2012 This week we start with praise for Bill Aris, who has built the greatest dynasty in US cross-country history. We then tell you why the 2012 Fukuoka Marathon will be remembered for what didn't happen rather than what did. Along the way we talk about 10 greatest half marathoners in history and wonder if anyone running more than 25 mpw or faster than 7:30 miles is killing themselves. Plus talk of Adam Nelson, Haile G, Paula Radcliffe and Martin Lel. A Must Read For Anti-Dopers: Paul Kimmage - The One Man Who Seemingly Has Always Tried To Clean Up Doping In Cyling - Gives An In-Depth Interview On Lance Armstrong, he says, "That would be my view - fantastic bike rider, but not a Tour winner. I would say no: He would not have won a Tour without doping." LetsRun tweeted that quote to Lance. He also reveals what it was like to discover his Irish heroes were dopers as well. Important News IAAF Wins 1st Case At Court Of Arbitration For Sport Involving Biological Passport Thanks to the biological passport, the IAAF was able to show repeated doping, which nets a 4-year ban. LRC Meet The 2012 European Cross-Country Champions LetsRun prides itself on promoting the sport's stars as individuals and not just as a group. Normally our efforts are devoted to "the Africans" but today we do the same for "the Europeans." Meet the junior woman who destroyed Mary Cain, meet the "Viking version of Centro" and potentially Italy and Ireland's next marathon stars. *Don't Give Up: Both Silver Medallists At European Cross Overcame Mid-Race Struggles Hassan Chahdi of France and Ana Dulce Félix of Portugal showed there is a reason why you run the whole race. LRC The Week That Was In Running: December 3 - December 9, 2012 This week we tell you why Wilson Kipsang is the best marathoner in the world, show you how Foot Locker CC is still > NXN, tell you how to PR in 13 straight marathons, talk about how some say EPO doesn't help you and give you our opinion on Ryan Hall's new coach. All of that plus talk of Manny Pacquiao and the Tour de France. After Failing To Make 2012 Olympic Sprint Team, Craig Pickering Is Now Focusing On Boblsed Pickering is a European indoor 60 silver medallist, so he's perfectly suited for the bobsled. Good Read: RunBlogRun Asks What Lies Ahead For Jordan Hasay? "There is an unspoken uneasiness around the fact that Hasay's phenomenal record as a young high schooler is not being fully replicated at the collegiate level ... Hasay's impressive record while at Oregon is nonetheless viewed by some as falling somewhat short of what might have been expected from an athlete who totally dominated her events as a prep." LRC The 2012 NCAA Cross Country Champs That Were We bring back our weekly recap by looking back two weeks to the 2012 NCAA Cross Country Championships. We start by praising the UConn women, Jordan Hasay, Abbey D'Agostino and ourselves before telling who flopped (Iona/Stanford), comparing Vin Lananna and Martin Smith, and telling you who the favorite is for 2013. Along the way, we crush the dreams of all college runners by telling them they likely won't improve (much) after their sophomore year before ending with talk about unbreakable women's world records.